For some reason the download is not working? Maybe just bad timing? Will have to look at this as well. When the SWTOR bug passes. Upload at Gamefront, less ads, faster upload/downloads. Yeah I didn't test the download first, it was only supposed to be temporary until I found a better place anyways (not used to not having a mod website ). Myfist recommended WinCustomize, which I completely forgot about as a Stardock ad free hosting option and decided to use that so I don't have to make a new account. I had UE_Carbon, Boshimi, and ZombieRus test out a beta version of this during our modders ICO game last Friday. Zombie built lots of culture center in the center of the map and almost took out Boshimi an hour or two into the game because he didn't build any culture of his own. He lost two planets to revolutions and would have lost his home world had he not scuttled a lab to build a culture center. I had been building 1 culture center every two planets or so and that was enough to protect my worlds from any allegiance decrease (save one asteroid that was right next to one of his culture worlds). That's basically a perfect test of what I want culture to do, not a serious threat to well balanced and planned out Empires but quickly able to do some damage to those that ignore it. That plus the economic bonuses make it well worth it now I think. I'll check this out when I get a chance tomorrow. Thanks. Above all else trade is the main thing I'd like feedback on. In particular I'm on the fence on what to do about the longest trade route. I forgot to mention this but I increased the trade bonus per longest trade route length to 10%, as I do like this mechanic because it rewards players who plan their trade routes for maximum income. However it also make trade extremely hard to balance as its the only mechanic that can be improved almost infinitely. It looks like you addressed some things that weren't implemented very well in default sins. In a nutshell that's the goal of this little project. If I can make it work I'd like to do something with Diplomacy (which despite a whole expansion is still lacking) and the pirates, but these have a lot more restrictions on what modders can do with them. But maybe I'll find a way, we'll see. Its amusing the first few times but it really makes you think how much harder the Advent AI (probably the easiest AI) could be if it just built actual fighters instead of mines. Especially as the fighters are free and the mines cost money. Not only that but the Advent has the best bomber in the game. Too bad the original AI didn't use them properly. I'll work it with my epic map and see what happens. There is two big things this mod will change. The first is that refineries give +25% more resources than normal, so the TEC players may have a bit higher resource income. But the other will be the increased number of neutral asteroids, as each uncolonizeable gravity well will have between 1 and 4. If you really want to optimize it for my mod you might want to diversify the uncolonizeable gravity wells, all of those ionic storms will lead to some amazing crystal extraction rates. Oh, and you can also give your pirates phase jump inhibitors with this. No problem I think. Just speeds up the game some. Thanks for the clarification. I really like the random encounters you've included in this. A lot. The advent AI is actually pretty decent with this mod. I wore down a TEC AI that kept sending ships at me and then an Advent AI came in and rushed his choke point, destroyed his defenders, blew his starbase up, and started bombing his planet. The random encounters are also done pretty well. They show up on a few planets and are a decent fighting force. However, with this mod they don't have insanely overpowered abilities and aren't on every other planet in the map. I like the new trading system too. It's no longer a matter of spamming every gravity well with trade ports. However, I noticed that trade port upgrades on starbases don't reduce the gravity well's trade income like the trade ports do. Was this an oversight or was it intentional since you can only build one starbase per gravity well? I did think about that, and decided to leave them alone for now. In addition to only having 1 starbase per planet, the trade port upgrade itself is really only used on uncolonizeable planets (to extend the trade chain), as its a lot more expensive than a standard trade port. The limited starbase upgrade slots also mean you're already forced to give up something on the starbase to get that tradeport, so I felt its already fairly balanced. Things could also get complicated with several different players having starbases in the same gravity well, as the trade reduction would affect that planet for each trade starbase regardless of which player owned it. And last but not least it would also take up a limited starbase ability slots that I may wish to put to better use later. That said, if it becomes clear that its in the players best interest to always use it to get around the trade reduction, I'll certainly fix that. Thanks, I actually developed that system to make an even more complicated mechanic for Requiem, but it turned out to be pretty flexible even with only vanilla ships and bonus/artifacts. Also, for better or worse I started messing with trying to finally fix the Diplomacy, or at least make it easier to use. Here's a little teaser. Do you guys ever play mods online? I have tried many mods and a good number of them are well done like this one. It's unfortunate that the only way practically to arrange multiplayer is to arrange it yourself with probably only 1 or 2 people never the large 5v5 games. And lol what is an Advent embassy doing around TEC structures? Is it like the envoys where I can't shoot at it and is it deployable as a like a type of SB? Sometimes, this was first tested by a group of people online. But yes, you do need to arrange it ahead of time, but with some of the more popular mods like distant stars you can get 3-6 people easily, and on a good day get enough people to at least say they want to do a 5v5. Getting everyone to show up is the hard part. Is it like the envoys where I can't shoot at it and is it deployable as a like a type of SB? Oh you can shoot at it, but otherwise that's mostly it. The envoy cruisers lost all of their abilities except the diplomatic immunity, which were given to the embassies. The embassies are now what directly improves your relationship with other factions. 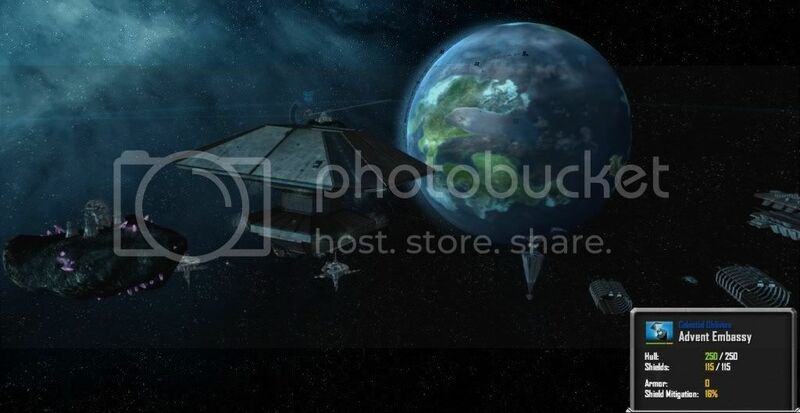 Its the envoy cruiser's job to build the embassies at neutral or friendly planets. As an envoy can build multiple embassies, basically you can now potentially go through an entire game with just one envoy cruiser and still max out your relationship with all of your allies. It also frees up room on the envoy for many more interesting ways to exploit your opponents. The hard part is getting the AI to use them but I have a couple of ideas, hopefully at least one of them will work. Assuming all goes to plan, what's your ball park ETA for getting the embassies in there? Not entirely sure yet, depends on how much I put into the second part of the update, which is what I'm replacing the rest of the envoy cruiser's abilities with. I sadly can't find the article, but I remember reading that the early concept for Diplomacy including plans for embassies and even sabotage and espionage. For various reasons these plans were either changed or abandoned, but I intend on restoring these features, at least to some degree. That said, I would say a ball park estimate would be no longer than a week. The only thing that might hold it up is that I will be need to get one new model in game and with all the art assets to accompany it, but we'll see. Thanks, please do pipe up. Makes me more productive if I know people actually using it. Also if anyone has any complaints/issues about the vanilla diplomacy system this would be the time to mention them. I can't do a whole lot about how the relationship modifiers are done or the pact system, but mention them all anyways and I'll try to do what I can to at least improve yet another disappointing civic feature. That's way better than forcing the player to keep ships at every single gravity well of the other players in order to generate a decent relationship. Like you said, the hardest part will be getting the AI to use them properly since it is already coded to send an envoy to every one of its allies' planets. Envoy's are definitely a bit of a pain mechanic wise (Does the AI build more than 8?). I've dropped the fleet supply to 4 in my mod, plus I've looked at options to create Embassies via star bases on friendly/allied planets as an option too. It sorta bugs me that envoy abilities function on Enemy planets and I'd rather take away that feature too so the incentive is gain relationships to get Envoy bonuses after a cease fire agreement is made. I'm not sure how you'll fair getting the AI to deploy multiple Embassies without some way to control how many of them get built. Good luck and I'll be curious to see what you come up with. That's way better than forcing the player to keep ships at every single gravity well of the other players in order to generate a decent relationship. I think so, it should allow every player to pursue diplomacy without sacrificing much fleet strength. The fact that you are actually ordering one unit around to do meaningful things instead of giving just 4-8 move orders makes it feel much more like a diplomat unit. And of course the new abilities I'm working on will make them work like spy units too, so hopefully we'll be getting a lot more mileage out of envoy cruisers even though we'll be building fewer of them. I don't know, but my real problem is 8 is overkill most of the time. You only need 4 envoys to max out 1 player's disposition for all the pacts, and if you are both giving each others pacts you don't need any more. Another reason I like the embassy system is that as they don't take any fleet supply, its best to build embassies on all of your ally's worlds just for the beneficial abilities they give. The problem with star bases is that the AI doesn't usually build them on your planets and it seems rather overkill for an embassy. Also a lot more expensive. Yeah that's why I didn't give embassies the diplomatic immunity ability and low hitpoints. You pretty much need at least a cease fire otherwise one hangar defense will take care of them. In fact I think embassy destruction will be a valid raid tactic, as it will prevent your opponents from getting the good pacts and stop those beneficial abilities like settlers from taking effect. Likewise that's why you should build embassies next to your allies defenses. I have an idea that I'm pretty confident about, even if it realistically doesn't make much sense. It will have to abuse the AI only research method you came up with to make the deploy embassy ability work differently for AI and humans, but it should work. It just involves taking my current single ability file into a multiple buffs system, but I hear you are pretty familiar with those. I was going to ask how you manage to get your flagship mod to limit them to one, but it sounds like you just have one structure that auto rebuilds them when they are destroyed. That's not really what I want as I need envoy cruisers to build more than 1 embassy, just on different planets. In the end I might just count on the fact that it makes no sense to build more than 1 per planet, and if you do it has no real impact on the game as the max relationship bonus is limited. Well, you can force the AI to build star bases is part of the point. And the cost of a star base isn't fixed and could change that for Embassies which was my original plan. As well as potentially upgrade to give defenses to allied planets but not really threaten them with offensive capabilities. I couldn't off hand think of a easy way to chain this together. It might be possible just not presenting itself easily as the target planet isn't owned by the Envoy in question. I felt like population and resource techs would be more useful (since allegiance was and would be higher than vanilla)...but, because I had more resources, I felt like the game got, i don't know, rushed? Like I was already moving on to bigger and better things without time to research the resource and pop techs? While not reading through every post, I read enough to see that this project is worthwhile. "If" you can make it work that is. Without going into specific statistical details ill go over the points i agree with. More Racial Diversity. Sure the factions of Sins are pretty diverse as it is to a point. However this is the first i have seen where specific factions get certain racial bonus's from the get go. I really like the ideas you have for random encounters. Sins needs this BADLY! and i am in total agreement that after playing a few games you pretty much know what to expect at each planet type. Thus making the "explore" aspect of Sins a moot point, because you already know what to expect. IMO the "exploit" needs more focus on top of the "explore" As was mentioned with the Diplomacy aspect of the game. Perhaps a few good ideas here can go a long way. I cant think of anything useful off the top of my head right now (still recovering from a hard week at work). I saw in one of the screenshots "Advent Embassy" which interested me as in what could a factions "embassy" do to give them an advantage. This would be on top of other "workable" ideas on how to "exploit". Ill check out what u got so far, and get back with ya.